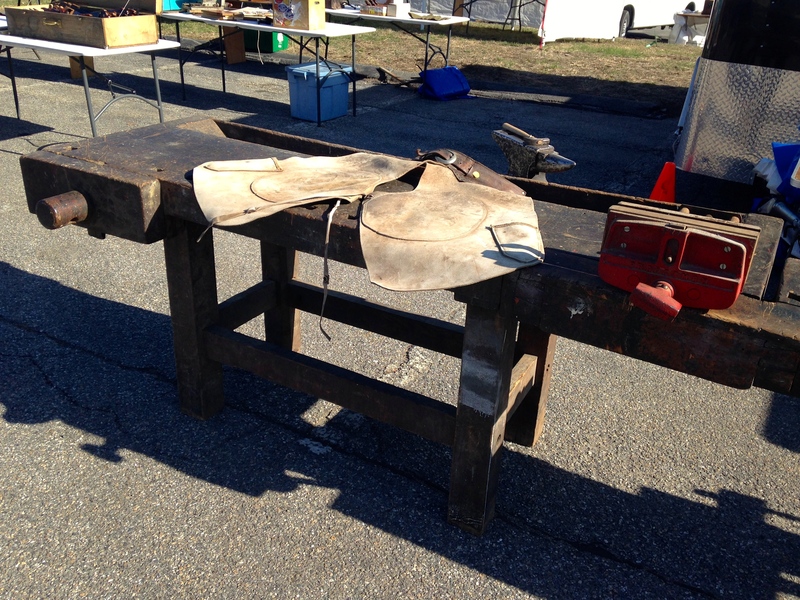 This past week I made my biannual pilgrimage to the ‘Live Free Or Die Tool Auction’ and tool sale out in the parking lot behind the Holiday Inn in Nashua NH. I’m glad my schedule worked out that I was able to go on Thursday morning — it was a beautiful day, I saw some friends who were only around on that day and didn’t spend too much money. Friday morning it was pouring so I briefly stopped by to see some friends from the school but many of the vendors were all packed up. 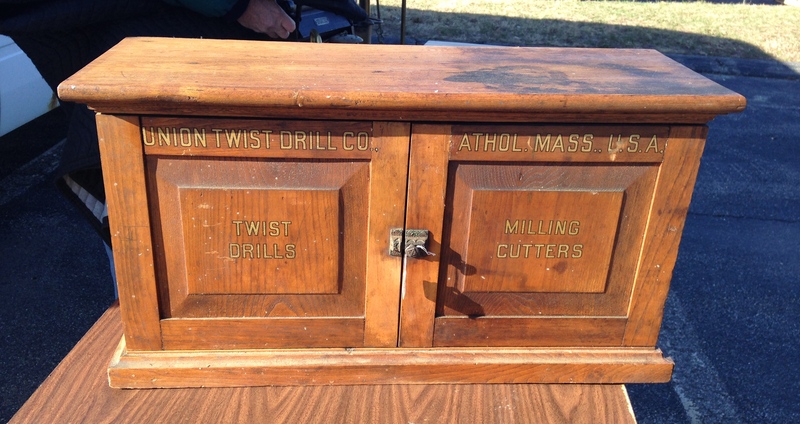 The cabinet below from the Union Twist Drill company of Athol Massachusetts (same town that is home to Starrett Tools) looked to be in great shape. 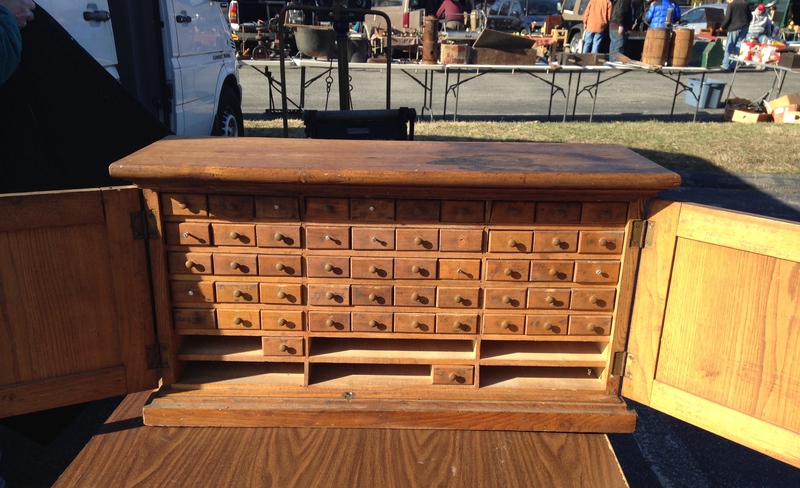 Inside the cabinet was a nest of drawers which once housed all kinds of drill bits and similar hardware. It was also interesting to see the notes scribbled on the inside of the doors. On another table was a nice looking moxon style vise with threaded wood handles. Made from a fairly large bit of timber I like how the maker removed a bunch of wood to make room for an angled saw. This year I finally got to meet Tony Murland in person. Over the years I’ve bought a lot of wood planes from his shop in the UK — including my matching pair set of hollows and rounds, snipes bills, sash planes and complex molders. 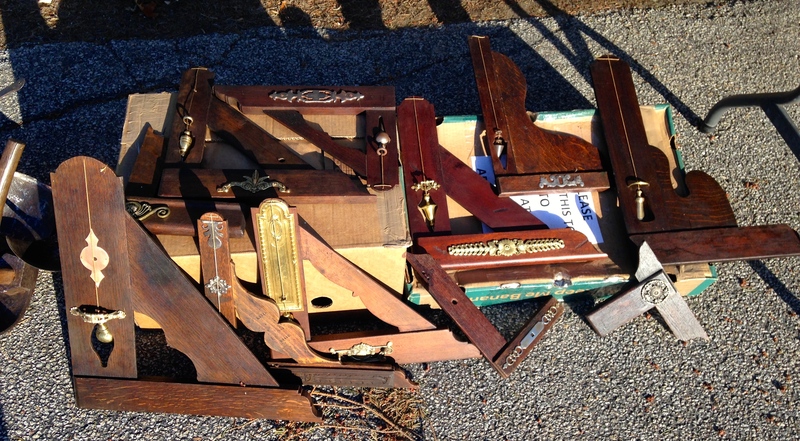 On hand he had a great assortment of French Plumb Squares — some of which had some great decoration on them. I would have loved to get one if I had room in the budget this season for it. 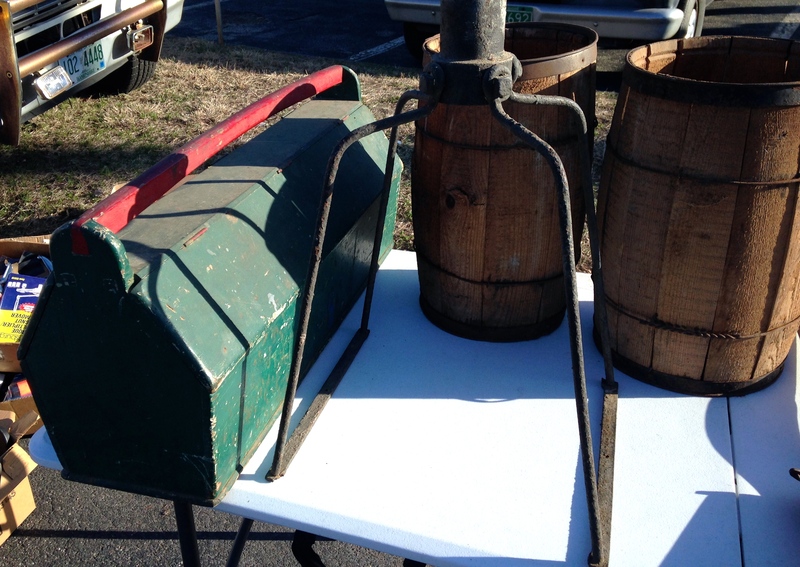 Casks of cut nails and a nice old tool tote with a dovetailed in handle and interior partitions. 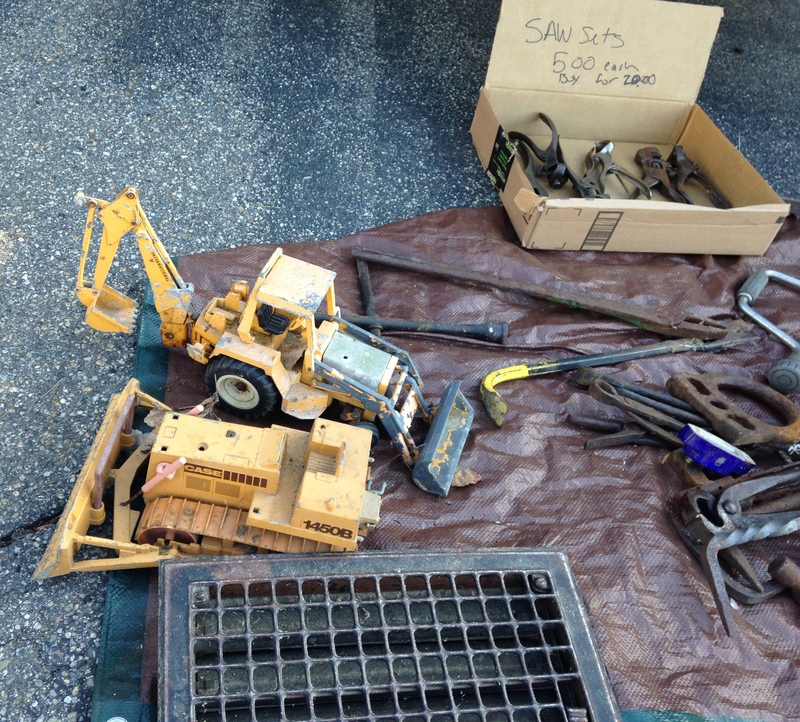 Next to a box of saw sets was an old 1980s Ertl Metal ‘Case’ backhoe/loader which was one of my favorite toys as child — and something I had not seen in years. If it was in better shape I might have even picked it up. As always some interesting benches found their way to the show. 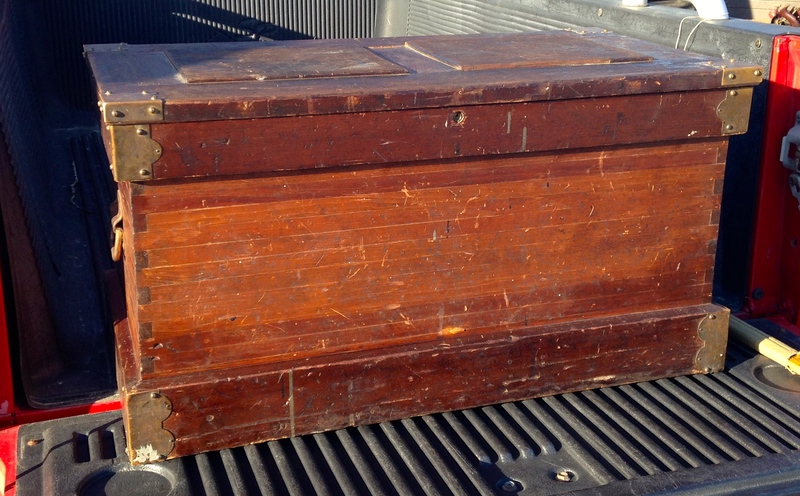 And here is a nice old tool chest that I spent some time looking at. 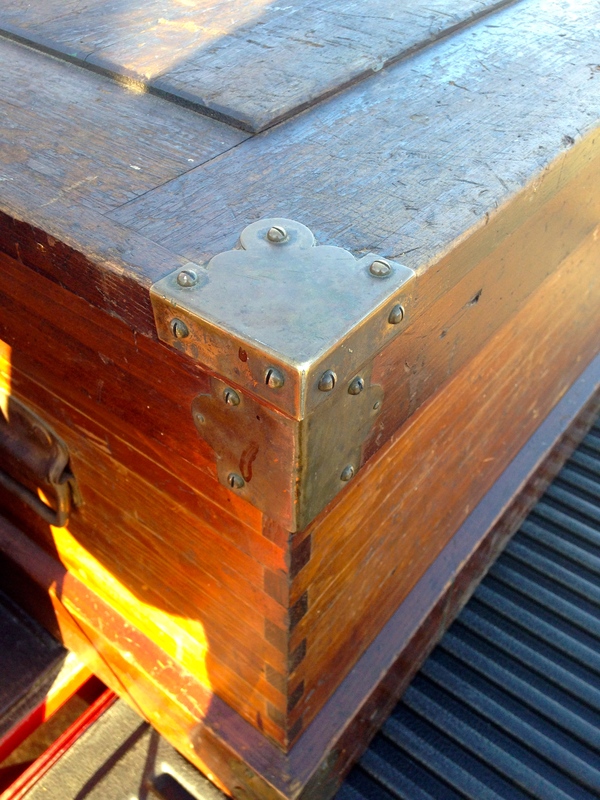 Constructed with finger joints, this chest had some handsome hardware I wanted to highlight. 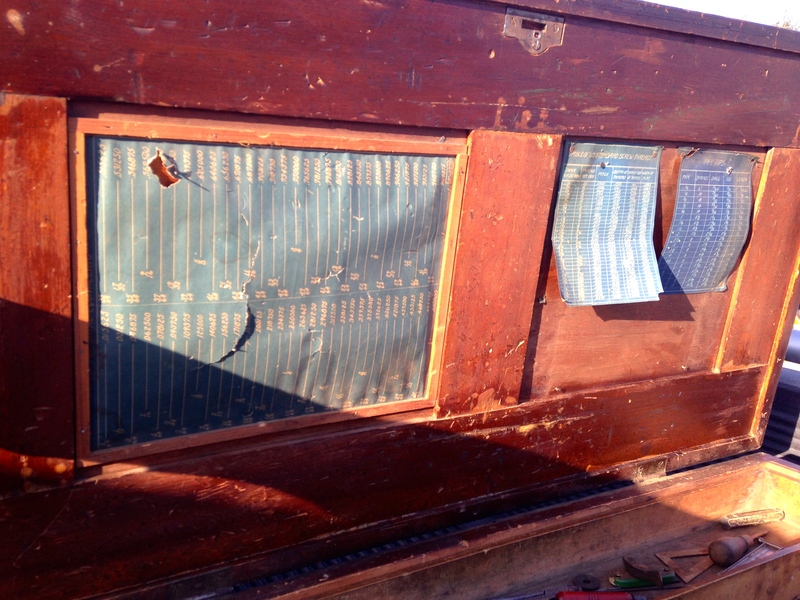 Inside the paneled top there were some great old reference/conversion tables tacked into place. The corners had some nice brass hardware and all of the screws were carefully clocked (oriented in a specific way) — I know this makes my OCD happy as it likely will make my friend Chris Schwarz smile as well. 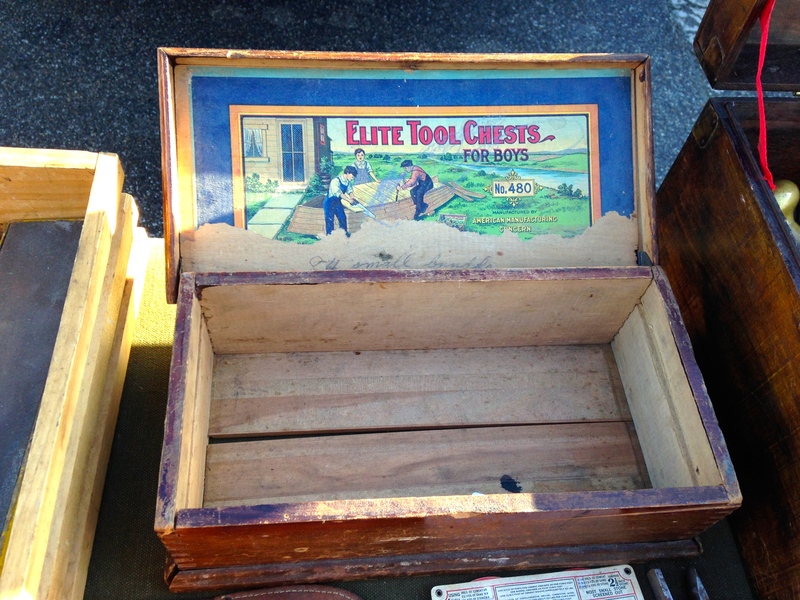 And last but not least was an ‘Elite Tool Chest for Boys’ that was used to haul some wares to the tool show. What did I buy this year? Not too much which is probably a good thing. I’m trying to keep to the tools I regularly use and I have a very good working set. Also my tools/wood/toy budget has been saving towards a tractor and building a barn this summer — more on that in some upcoming posts. I bought nice Stanley Bailey transitional jack plane that I’ll be using to clean up some timbers — that wood sole will be a lot easier to use on green timbers. A nice metal block and tackle with a line lock that will be useful on a gin pole and about a dozen old manual training guides, tool catalogs/reprints and old woodworking texts. Previous PostAlcohol In The WorkshopNext PostStumped? How does one get on the mailing list for this event? It runs every April and September so I usually just search online for the ‘Live Free or Die Tool Auction’ to see the dates and add them to my calendar. It’s interesting that the sides of the tool chest seem to be made of many small strips of wood, and the ends of those used to form the finger joints. I’ve seen that before in a different tool chest (also on your site if I recall correctly). Yes, that is a good point I didn’t mention in the write-up, but one of the many interesting features of this chest. I’m canibalizing an old hand screw to make a copy of that moxon vise. I was wondering about the square buttons on the foreground chop. Any ideas about their purpose? 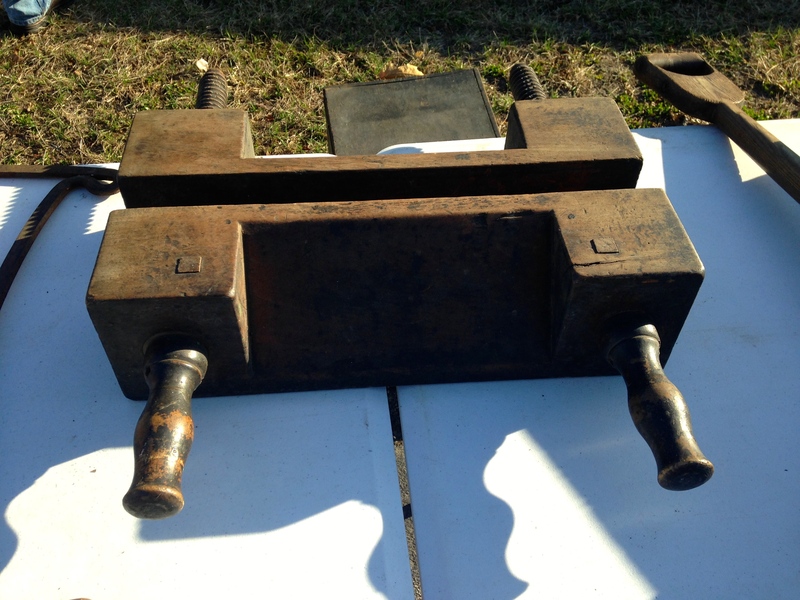 I believe the square buttons were for what was called a screw garter — this would keep the front jaw of the vise attached to the screws and thus moving together. In the photo and post below you can see an example of a garter installed at the rear of the vise meaning the rear jaw would stay fixed and the screws would move the front jaw forward. Stephen’s plans work great for a vise mounted under the bench-top as he shows, the vise in my photo would be mounted on top of the vise, so the maker’s location makes sense to me. Thanks Bill. That makes sense.